Michaela Munsterteiger, a 20-year-old junior at Montana State University, aspires to follow in her grandmother’s footsteps by becoming a nurse and helping others. 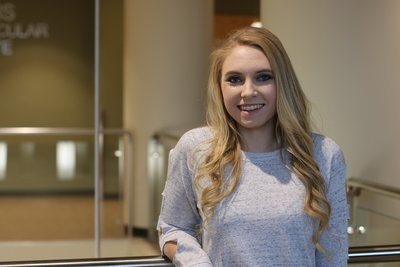 Thanks to donors who generously support the Benefis Foundation Healthcare Scholarship Program, Michaela won two scholarships—the Jane M. Buckman Husted Nursing Scholarship and Cecil and Dorothy Goodbrand Memorial Scholarship—which will help her earn a Bachelor of Science degree from the MSU College of Nursing program. Winning these scholarships has given me an extra push to do the best I can to represent Benefis and the donors who support the scholarship program. Michaela is one of 34 college students to receive healthcare scholarships from the Benefis Foundation for fall 2018 and spring 2019 semesters. In total, $77,500 was awarded to these deserving students. “My scholarships have greatly helped me pay for school this year, and I am very grateful,” said Michaela. The Healthcare Scholarship Program is designed to assist with the development of skilled healthcare professionals in our region. Dozens of scholarships are available to students who are pursuing a degree, certification, or advancement in a medically related field. The Benefis Foundation has awarded more than 620 students with $1.18 million in scholarships since the program began in 1998. Please consider supporting the Healthcare Scholarship Program with a gift to the Benefis Foundation. Your contribution will help students like Michaela earn their degree and help our community gain skilled and compassionate healthcare professionals.